This is the first blog of a number dealing with the NXP LPC17xx/40xx processor families and how to program them despite the lack of documentation. The next blog will deal with implementing the LPC17xx/40xx UART with interrupts properly, and a subsequent blog will show how to use the UART in RS485 Normal Multidrop Mode (NMM) with Auto Address Detection (AAD). My company has decided on using the NXP LPC17xx/40xx processor line for all our embedded projects. Since each processor in the line is very similar to the other processors, I wrote a hardware layer that would handle all processors. The differences are handled by reading the part ID to determine which processor/family the application is running on. But it started getting very expensive flash-wise when I started making tables showing how much memory each processor contained, if it could handle 120 MHz or not, etc. The part IDs didn't make much sense. Why not just give them the values of 1774 to 1788? Then I realized that they were flags that showed the capabilities of the processor. So I sat down with the various manuals and started decoding the flags. After about an hour, I ended up with a set of #defines that masked out bitfields or defined bits denoting the capabilities of the processor. The part ID is read by calling into the NXP boot code at address 0x1FFF1FF1 using the In Application Programming (IAP) command 54. See the Flash Memory chapter in each processor user manual for more information on how to make the call. One thing not mentioned in the documentation is that you must disable interrupts because the exception vector table at address 0 may be remapped during the call. NXP LPC17xx/40xx processor line comes in two families with four groups in each family. 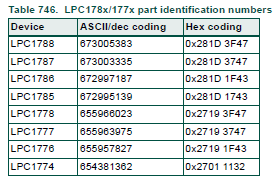 The processor families are LPC17xx and LPC40xx, and the groups are LPCxx5x, LPCxx6x, LPCxx7x, and LPCxx8x. The following are the definitions I use to extract the various bit fields and flags. To extract a bit field, shift the part ID right by the shift value and then apply the mask. To check a bit, AND it with the part ID and check for nonzero. Thanks for posting your first blog Ricky. This looks like a promising series that will most likely be useful to many. I am facing this issue with LPC1768-----> the RTC work fine only with mains power ON,even if coin battery of 3.3v connected to RTC pin. While initiating the program the backup registers need to be read to load the RTC value. But in my case after resetting the power the backup registers not storing the RTC value. You should check the voltage on the VBAT pin with power off to the processor and make sure that you see 3.3v on the pin. If you don't see any voltage, the battery may be dead, or the battery circuit is bad. Also make sure that you are writing 0 to the undefined RTC register bits. Some bits are used for testing and can cause the counters to all increment at the same time or not increment at all. You also need a 32 KHz crystal connected to the RTCX1 and RTCX2 pins. Without it, the RTC won't count. 4. Write 1 to the Oscillator Fail bit (RTC_OSCF) in the Aux register (RTC_AUX) to clear the Oscillator Fail detect flag. Thanks for your information, I will check with my design..